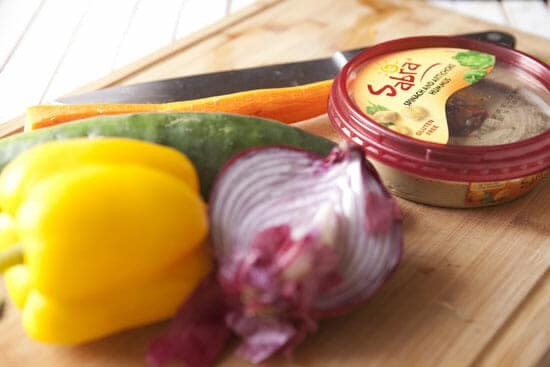 This post is sponsored by Sabra and their Ultimate Tailgating Experience! They are giving away thousands of footballs, hats, and shirts, not to mention $100 NFLshop.com gift certificates and ten $1,500 grand prize packages! You can sign up to win at www.sabradiplife.com. Tailgating at any sporting event is an art form. This art form tends to take the shape of lots and lots of meat and beer. Let me be the first to say that I truly love this art form. I will grill and smoke and consume with the best of ’em. But hey, guess what? Vegetarians like sports too. Also, it might not be a terrible idea to supplement your one pound burgers stuffed with chicken wings with an actual vegetable so your arteries don’t collapse halfway through the second quarter. S0, part of the tailgating art form is bring something that’s tasty, but also somewhat healthy. These Veggie Pinwheels are super-easy to make in advance and have a ton of flavor and crunch to them. Your vegetarian friends (and arteries) will love you. 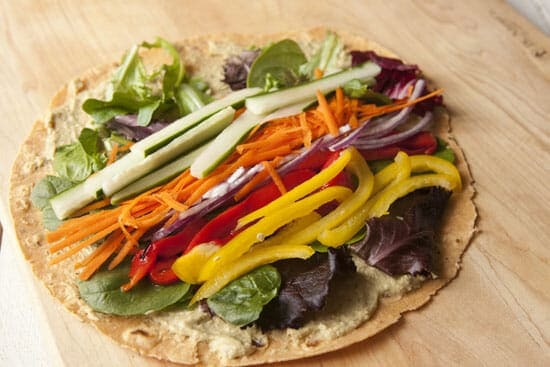 A hearty, but healthy wrap with creamy hummus and packed with a ton of crunchy veggies. Sliced into pinwheels for easy serving! 1) Take your time to slice all veggies small and uniform. Slice red onions thin. Halve the cucumber, remove seeds with a spoon, and slice into 2 inch matchsticks. Slice peppers into same size matchsticks. Peel and grate the carrot. 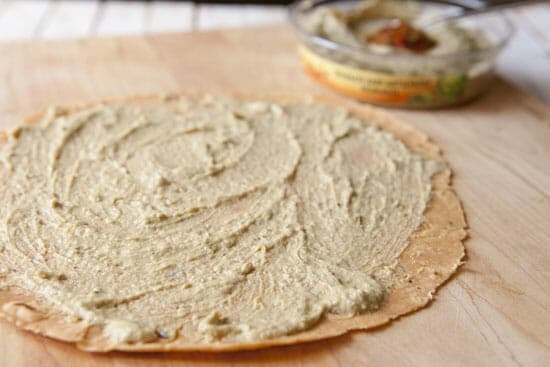 2) Lay out a large flour tortilla and spread with about 1/4 cup hummus. 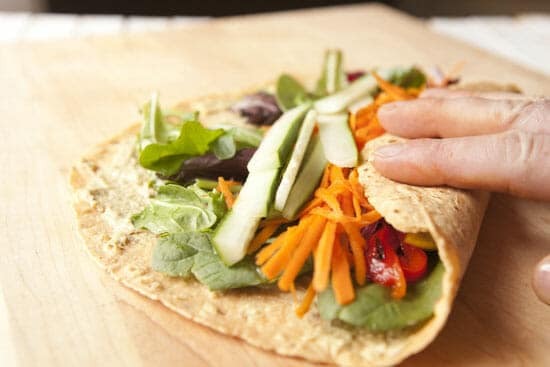 Add a layer of greens to the wrap. 3) Pile on veggies. You can use a bunch of them, but make sure you can still roll the wrap up. Make sure all the veggies are aligned in the same way so it’s easy to roll. Season the roll with a pinch of salt and pepper. 4) Roll the wrap up working slowly to make sure the roll is nice and tight. 5) Use a sharp knife to cut each roll in half and then cut each half into 3 even-sized pinwheels. If the pinwheels fall apart, you can also cut each wrap into fourths instead of sixths which will help. Serve immediately! If you aren’t serving immediately, it’s better to store the wraps whole and slice right before serving. These fun veggie pinwheels start with lots of fresh, crunchy veggies. I chose some basics: peppers, cucumbers, red onion, and a carrot. Nothing fancy here. 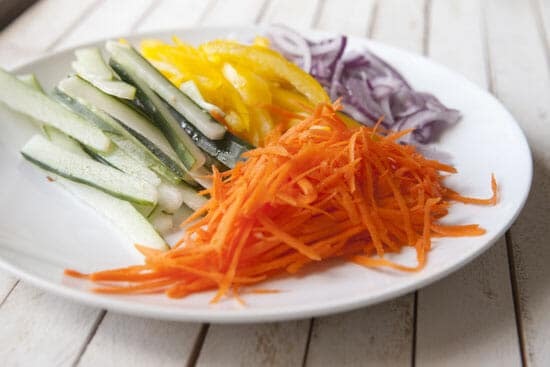 The only tricky part about the veggies is to make sure you take the time to slice and dice them into similar-sized pieces. 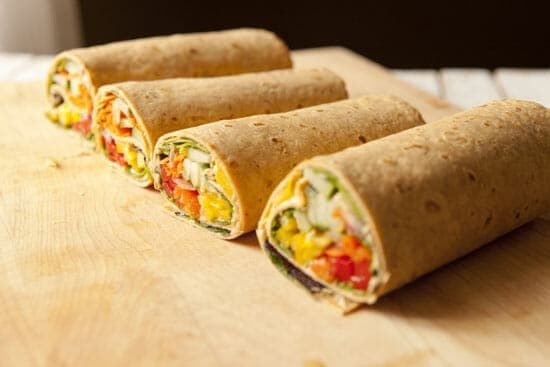 It’ll make it easier to roll the wraps and also ensure that nobody gets a huge bite of red onion or something. For the carrot you can just peel and grate it, but for the other veggies, just slice them into thin matchsticks. I seeded my cucumber, but let the peel on. 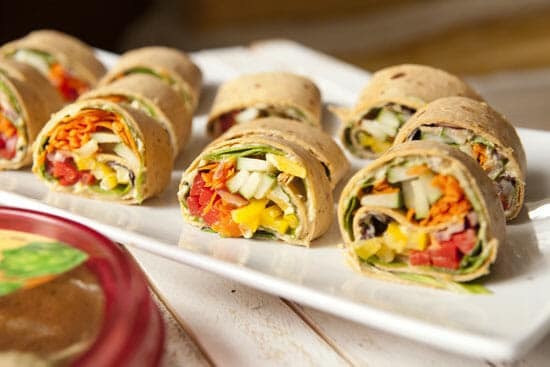 Grab the largest flour tortillas you can find for the Veggie Pinwheels. I like using the tomato flavored ones personally. Then add a good schmear of hummus to the tortilla! I used spinach artichoke Sabra hummus for my version, but any flavor will do. I would really like these with their supremely spicy flavor also. You can spread whatever hummus you’re using all the way to the edges of the tortilla. Then I like to lay down a base layer of greens. I just went with a mixed green variety and anything from spinach to arugula will work great here. Now it’s time for the veggies. The only trick here is to make sure you lay down the veggies all going the same direction. This will make it easier to roll the wraps and also mean that when you slice them you get clean cuts through all the veggies. As you can see, you can really pile on the veggies. You can really pile these on. Then just carefully roll the sucker up! Work somewhat slowly and make sure the roll is nice and tight. Otherwise, the pinwheels will just fall apart. Once they are rolled you can honestly just eat them like that if you want. But if you’re serving a group, it might be easier to make finger food out of them. If you want to actually make them Veggie Pinwheels, just use a very sharp knife to cut the wraps in half. Then cut each of those halves into thirds or halves and the pinwheels are done! I was able to get thirds out of mine but some of the edge pieces were a little rough around the, well, edges. That’s it team! Of course, these aren’t just for tailgating. 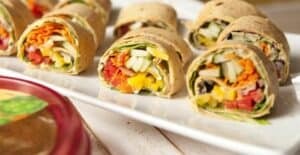 These Veggie Pinwheels would be excellent for any party or just for a simple, healthy weekday lunch. Give them a shot though! Also, be sure to check out Sabra’s Ultimate Tailgating Experience. There are tons of prizes and you get a coupon just for entering! Oh yea Felicity. I’m not sure if they are in Australia. As you say, any hummus will get the job done. :) Thanks for reading! Did we miss the cookbook giveaway? I love Hummus, these will be fab! Will they hold over night? Or will they be soggy? Hey Roxy, I think they would be fine for a night. I’m not sure I would go longer than that though as they might get a bit soggy after a few days. Good luck! Love the recipe! We are having a potluck at work and I want to make these. Could you tell me how far in advance I could make the pinwheels? Could I make them the night before? Hey Sandy, you could make them the night before without too much worry. I don’t think I’d make them more than a day in advance though or they will probably get soggy. Good luck!